The weather is (finally) cooling down again here in New York, and it’s starting to feel like fall (again), so I took the opportunity to finish up the sleeves of my Versio sweater. Holding 2 strands of yarn together throughout the entire thing, and knitting it on a US 8 (5.0 mm) needle. I’m also adding the hood modification that Rililie on Ravelry wrote up. 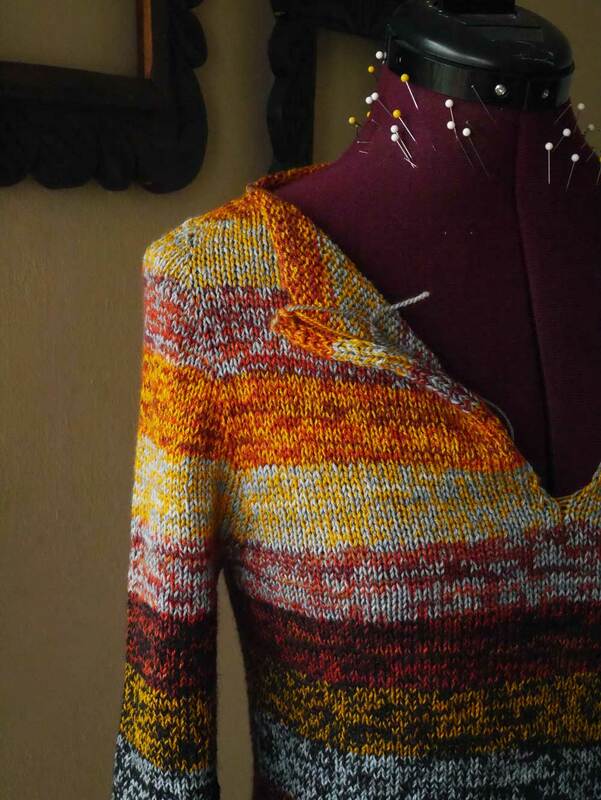 The pattern is knit top down, seamlessly, and using the contiguous set in sleeve method. I had never head of this method for creating set in sleeves – but I might have fallen a little bit in love. The armscyes are a little bit deep on me, so it does some funky pulling/puckering under the arm, but not badly enough to make it unwearable. 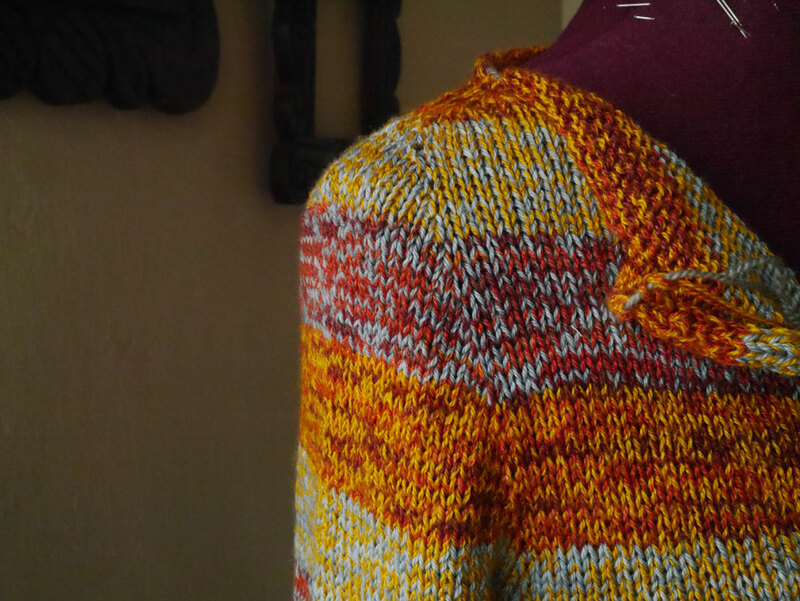 The striping sequence has evolved a bit during the knitting process. 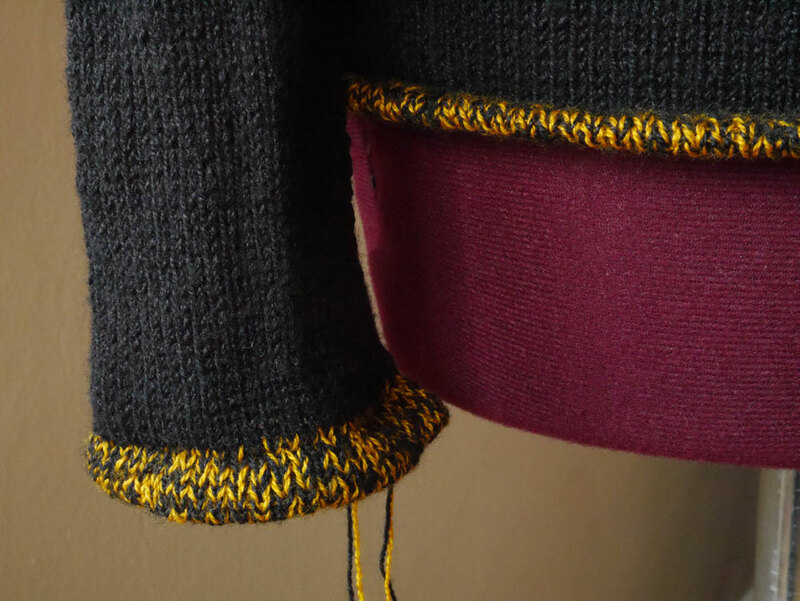 The original idea was to just use the blue, the gold and the red, working the stripe sequence you see on the yoke, for the entire sweater. 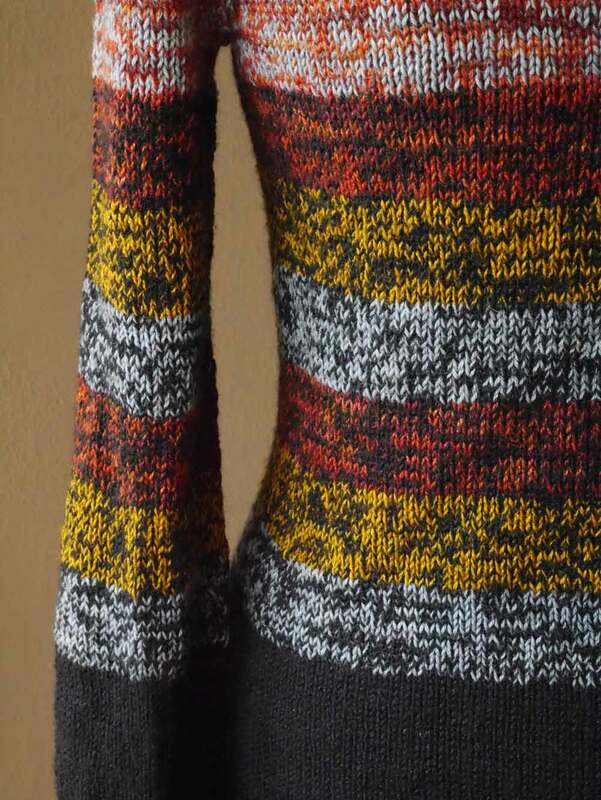 Turns out, I was going to run out of yarn really quickly if I did that – so I added the black, and planned on working the stripe sequence you see in the middle section of the sweater, for the entirety of it. But I was still probably going to run out of yarn – so I switched to solid black for the bottom portions, and reintroduced the gold for the hems. I’m a little ambivalent about the project right now. I like it, but I originally wanted this sweater to fill the role of an easy to throw on – but not boring – works with jeans or a skirt, sweatshirt type sweater, in my self-made wardrobe, and that’s not what this is anymore. I’ll see how I feel once I add the hood. But this sweater has definitely morphed into a sweater that is different than the one I originally planned.